Amid a mess of digital clatter and bang, the trailer for the shiny new TOTAL RECALL asks, “What is real? 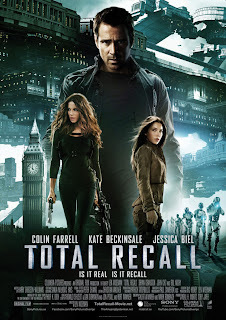 What is recall?” It seemed to imply that the film’s many narrative omissions – Mars, mutants and Paul Verhoeven’s devilish humor are all M.I.A. - would be compensated for in intricate storytelling. While there’s some tossed-off adequately Dickian talk about objective and subjective realities, and physical experience versus the mind’s chemical reproduction thereof, the film fumbles the story’s labyrinthine potential into a single, endless corridor of gunfights, car chases and limp political rhetoric. Limiting its setting to a chemical-ravaged, overpopulated Earth, RECALL splits its time between the world’s two remaining habitable regions: The WASPy, upper-crust United Federation of Britain (UFB for short), and The Colony (Australia), a working class melting pot comprising the marginalized working class. The rest is pretty similar to the RECALL you remember – Cohaagen (Bryan Cranston) and his expanding, iron-fisted UFB are at war with a revolutionary faction, who are fighting to maintain the civil rights of the workers. Caught in the middle is Douglas Quaid (Colin Farrell), a discontent nine-to-fiver who, after visiting a recreational memory implantation business, discovers he may or may not be a double-agent super spy. Commence ‘splosions. Directed by Len Wiseman (UNDERWORLD), the film’s world feels expansive, but also hopelessly familiar. The rainy, pan-Asian sprawl of The Colony is lifted straight from BLADE RUNNER, while the UFB’s sleek, flying cars and glittering geometry are futuristic in the most broad and anonymous sense. Hologram generators, pervasive touch screens,security robots... Why such a bland palate of sci-fi standbys? The Internet hive-mind has written exhaustively on Hollywood’s post-DARK KNIGHT fascination with earthbound genre storytelling, so I don’t need to mount that particular soapbox. But seriously… Screenwriters Mark Bomback (UNSTOPPABLE), James Vanderbilt (ZODIAC) and Kurt Wimmer (SALT) seem to have done everything in their power to prevent this movie from being fun. I’m not cheesed off that they did away with the bug-eyed suit depressurizations, the latex-laden Mutantville or Kuato (here the revolution is coordinated by the intensely Laconic Matthias [Bill Nighy])… but I've got significant beef with their idea of suitable replacements. We get two major female characters: Quaid’s wife, Lori (Kate Beckinsale), who fares better than her counterpart in the previous film, and Melina (Jessica Biel), one of the revolution's higher ups. However, the movie is so devoted to elaborate, overlong action sequences that we leave the theater far more familiar with their fists and elbows than their actual personalities. It’d be partially forgivable if any of the fights or setpieces were worthy of their ubiquity, but even the extended elevator chase sequence, which lots of folks have praised, isn’t original enough to earn its runtime. The movie also calls repeated times out to dally in ludicrously simplistic politics. The whole reason most action movies depend on classic idealogical binaries – like the corrupt government vs. the oppressed, powerless citizenry - is to create an easy emotional hook without having to cut into the action. Armchair cries of “power to the people” do not a manifesto make, yet RECALL blusters on without nuance, subtlety or even a hint of humor. Perhaps if Cranston’s Cohaagen were onscreen long enough to evoke a true sense of villainy they wouldn’t have to spend so much time explaining the injustices he's allowed. Still, did the filmmaker’s really think something so facile could be intellectually engaging? If I cared enough, I might be offended. I know David Cronenberg worked for years on a draft of TOTAL RECALL before Team Verhoeven dumbed it down for Arnie fans; I don't suppose this "reboot" owed anything to him and the original PKD "We Can Remember It For You Wholesale" short story?